WZZD-AM makes the switch to Talk Radio! How to Lose Your Job in Talk Radio - Go Anti-War while working for Clear Channel! Rush Limbaugh confesses to drug addiction! Rush Limbaugh Resigns from ESPN over Racist Remarks! Radio personality hopes to get out of dog house! Move Over, Right Wing Radio - the Liberals Are Coming! Media Lobbyists spend millions on travel junkets for FCC officials. Will it "Pay off"? Is Rush Limbaugh's Career Over? He's Toast! Make Room for LOCAL Talk Radio! He'll Come Back as Strong as Ever! PhillyTalkRadio.com is NOT affiliated with, nor represents any radio station, talk show host or advertiser. PhillyTalkRadio.com is run by fans for fans of Talk Radio. 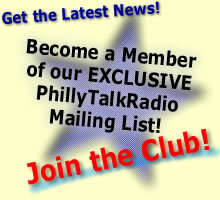 PhillyTalkRadio.com depends upon YOU, the fans of Talk Radio. If you have a question or comment about Talk Radio Stations, Shows or Topics, post it in an appropriate forum in our Message Boards. DO NOT SEND *QUESTIONS* OR *COMMENTS* TO THIS EMAIL ADDRESS! POST YOUR QUESTIONS AND COMMENTS ON THE MESSAGE BOARDS!